The usage of sound by the military-industrial-scientific complex has become increasingly well-documented in this century: an inventory including everything from simple stun-volume assaults with pop music, to “enhanced interrogation” sessions with the same, to deployment of LRAD [long-range acoustic device] “sonic cannons” for counter-insurgency or riot control applications. 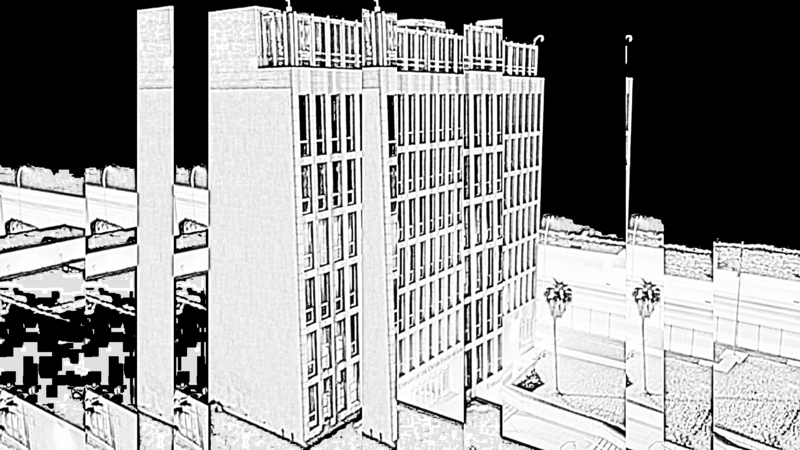 It was with this in mind that we approach a sonic experiment inspired by a controversial international incident in 2017, in which diplomats from the United States in Cuba experienced an attack with a sonic weapon described by one of its targets as “an invisible wall cutting straight through his room.” Immediate effects included pain and disorientation. Longer-term effects included mild brain injury, with symptoms including cognitive impairment and memory issues. The immediate reaction from the science community was inconclusive; the effects didn’t match what we know about sonic weapons. Since early 2018, we have been experimenting with reproducing this sonic effect at an intensity that is low enough to avoid the short-term or long-term effects. We would like to invite you to a private preview of Interference [Havana], the initial results of our experiments. as a sound and light installation. It is a relatively safe adaptation and interpretation of the original 2017 sonic attack, in which you may voluntarily confront the reality of psycho-acoustic weaponry and sonic deterrents. While we have avoided reproducing any of the dangerous effects of the initial incident, hearing protection is recommended, and you should attend at your own risk. 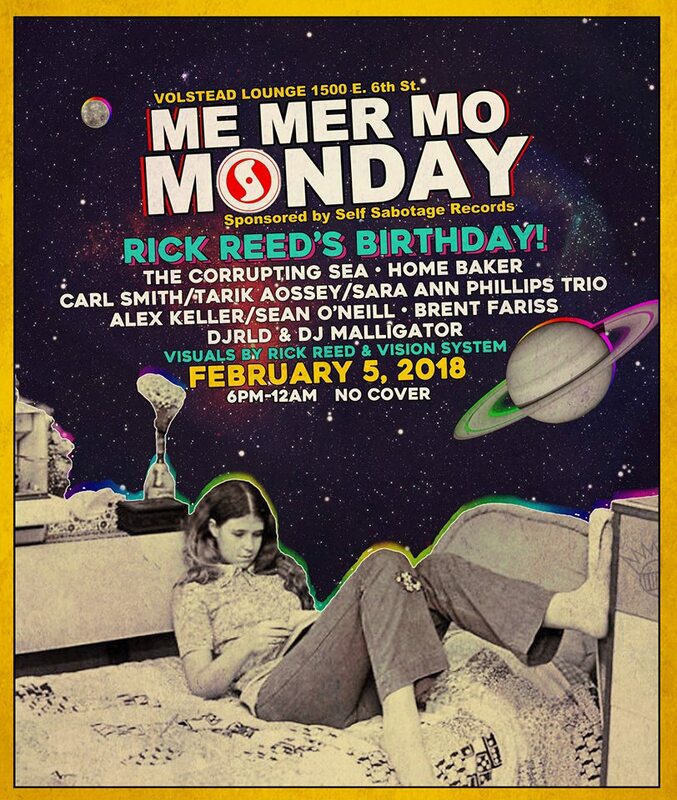 Robert Aiki Aubrey Lowe, Mélanie Genin, Dallas Acid + Hairy Sands,ECCO Screen, Dane Rousay + Megan Easely, Vicky Mettler, PrismATX,Thomas Echols + Invoke, Seth Graham (Orange Milk Records), Quite Eyes of Air (workshop & performance), DAMN Ensemble, Lovely War,Ara Hernandez, Mongoose, Victor Lovlorne, bright blue beetle typewriter consort, Mister Smile, Charlie Russell & friends, Ted Carey, Matt LaComette, Jeff Young & Paul Pinto, ‘CONFESSIONAL’ (featuringJamison Williams, Jim Ivy, Thomas Milovac, and Charles Pagano),Leisure Muffin, Try Not To Make Sounds, Primary Mystical Experience,Many Birthdays, The Ak’chamel Giver Of Illness, Phonography Austin,Ben Aqua, Tarotron, Couture Voltage, DAMN Ensemble, and a few others TBA soon! Admission is $5-$15 per set at any time at the door but the best way to support our program is by purchasing a day pass or entire weekend event pass for $50. Support our entire program by purchasing the 3-day pass for $50. On World Listening Day, Wednesday, July 18, the public is invited to meet Phonography Austin group members at Duncan Park at 7:00 PM in Austin, Texas. 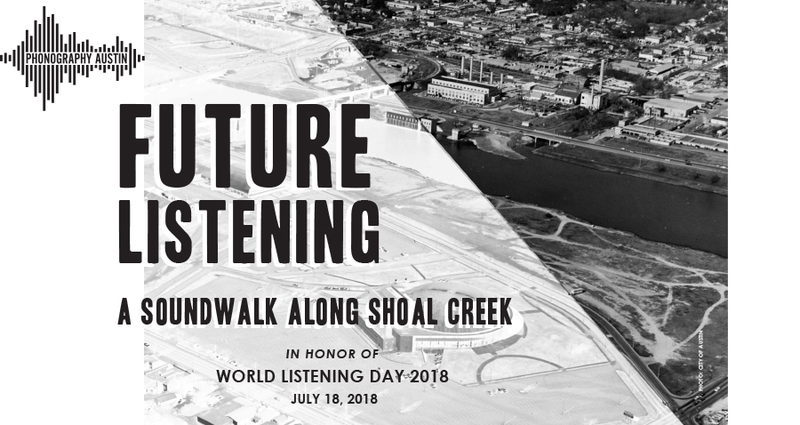 The theme for World Listening Day 2018 is Future Listening; we will consider how the soundscape of Austin has changed and how it will continue to change. We will conduct a listening exercise, provide an introduction to sound maps, and have a soundwalk along Shoal Creek to Lady Bird Lake and back, concluding roughly by 8:30 PM. Participants should wear walking shoes, bring water and something to write with, and are encouraged to bring sound recording devices. World Listening Day is an annual global event, held on July 18, to celebrate the listening practices of the world and the ecology of its acoustic environments, raise awareness about the growing number of individual and group efforts that creatively explore acoustic ecology, and design and implement educational initiatives that explore these concepts and practices. Phonography Austin is an arts organization that works on projects related to phonography (the creation and presentation of field recordings as art objects) and acoustic ecology (the study of the effects of the acoustic environment on those living within it). 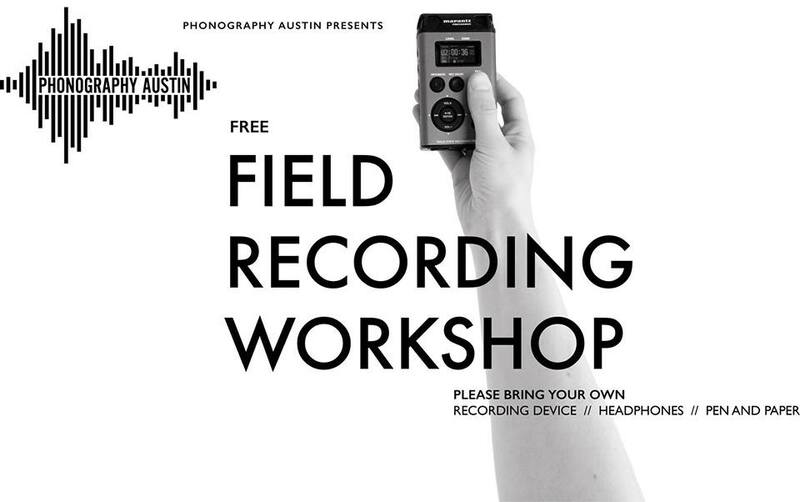 Phonography Austin will present a free workshop on the technical theory and practice behind creative field recording. No previous experience is required. Participants should bring something to write with, headphones and a sound recording device of any kind. Use something you already have or can easily borrow. Participants will spend some time discussing the science involved in making recordings, and break for a field recording scavenger hunt. After that we will meet to review the recordings and discuss any specific insights or technical issues that may have arisen. 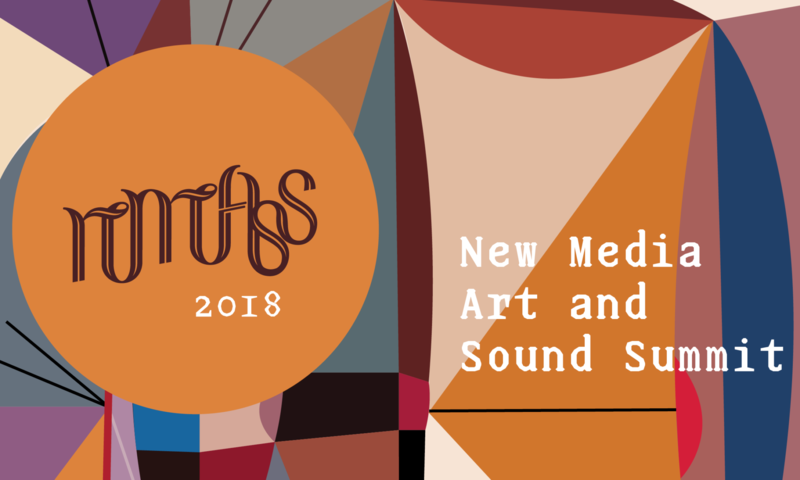 The workshop will happen in Room 621 of the Austin Central Library at 710 W. Cesar Chavez St, from 10 AM to 2 PM on Saturday, May 19, 2018, and will be led by sound artist Alex Keller. GRACKLE CALL is a performative audiovisual tour that directs audiences to the roosting locations of the Great-tailed Grackle. Mimicking a birding experience, participants will be provided with binoculars, mp3 players, and a printed program guide that will direct them to experimental performances, installations, radio stories, and soundscapes examining local grackle lore, appropriation, human impact on species behavior, migration, land use, and the many failed human attempts to control the species. Featuring a roster of local birders, journalists, poets, musicians, artists, and performers. 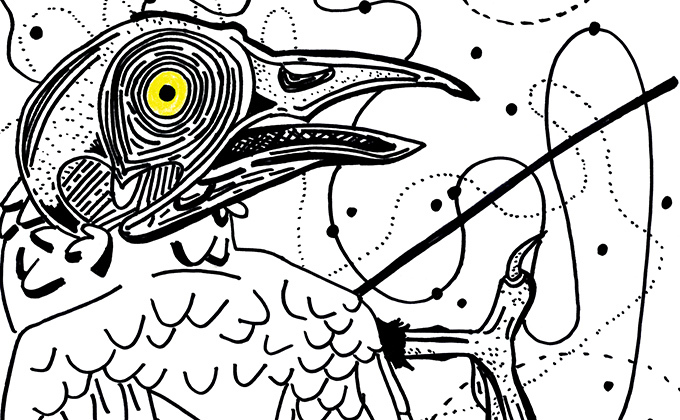 This project is augmented by a series of free community workshops that explore birding, listening, and writing & a free iOS app that responds to the user’s GPS coordinates to play original audio content directing them to locations throughout Austin. The Grackle is perhaps the most controversial and beloved bird of Austin. By morning, they greedily eye our breakfast tacos; they hold court on telephone wires at midday, and they flock to the trees of the local H-E-B at sunset to commence their cacophony. Grackles are an idiosyncratic part of daily life in the city. The Grackle species, whose history dates back to the Aztec empire, is a kind of clock, telling the rhythms of our city, but also evoking a rich past that predates Austin. This strange and beautiful bird is the subject of Steve Parker’s new project Grackle Call, an immersive sound walk and ode to the bird. Audience members will be guided on a walking adventure, where they’ll discover the natural life of the city through dance, installation, poetry, and sound, and find themselves on Grackle time. •We ask that you bring your own headphones and smartphone to access the audio tracks for the piece. If you do not have access to a smartphone, a limited number of MP3 players will be available to borrow. •We will have binoculars available to borrow for most audience members, but you are welcome to bring your own binoculars, which will help us provide binoculars to more attendees. 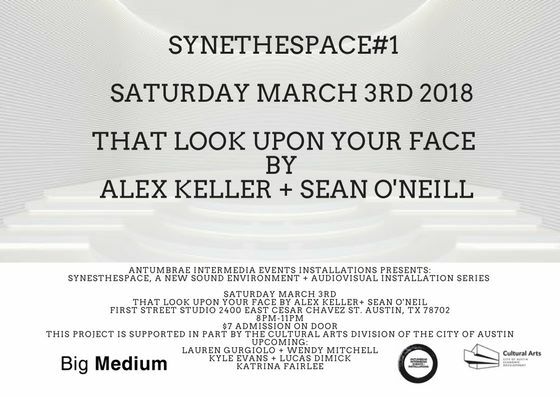 Antumbrae Intermedia Installations presents SynesthESpace#1ˌ: That Look Upon Your Face by Alex Keller and Sean O’Neill. All artists will introduce their work in addition to presenting a live performance component to stimulate the environment during the evening. The concept for this project is originally based upon LaMonte Young and Marian Zazeela’s ongoing light and sound installation called the “Dreamhouse” in NYC. For optimum satisfaction, audience members are encouraged to spend time and explore subjective physical and phenomenological experiences, activated by the sound and visual output of each unique environment. Please bring cushions, mats, pillows and blankets for relaxation and enjoyment during each event. Keller/O’Neill will use sound, light and video to delineate constantly shifting boundaries within an open space. High-contrast imagery sourced from microscopic video and crude video synthesis will mirror and juxtapose with the sounds created from field recordings and homemade or industrial-grade sound synthesis. Stroboscopic light and sound that can include a hypnagogic effect may occur. The artists will periodically interact with the sound space created. In 2017, they released an LP called Kruos on the Elevator Bath label, and a CD called LCLX on the Mimeomeme label. Sean O’Neill is a multi-media artist, who explores both the visible light spectrum and the audible frequency range to determine how they influence our lived environments, and vice versa; he has a stated interest in how perception shapes the dynamics of spatiality. With support from Austin’s Cultural Arts Division. $6 select craft cocktails, $3 Wells and Lonestar. No cover. Sponsored by Self Sabotage Records. ***Experiment with two-for-one burgers at the Volstead/Vegas food truck – now open Mondays. 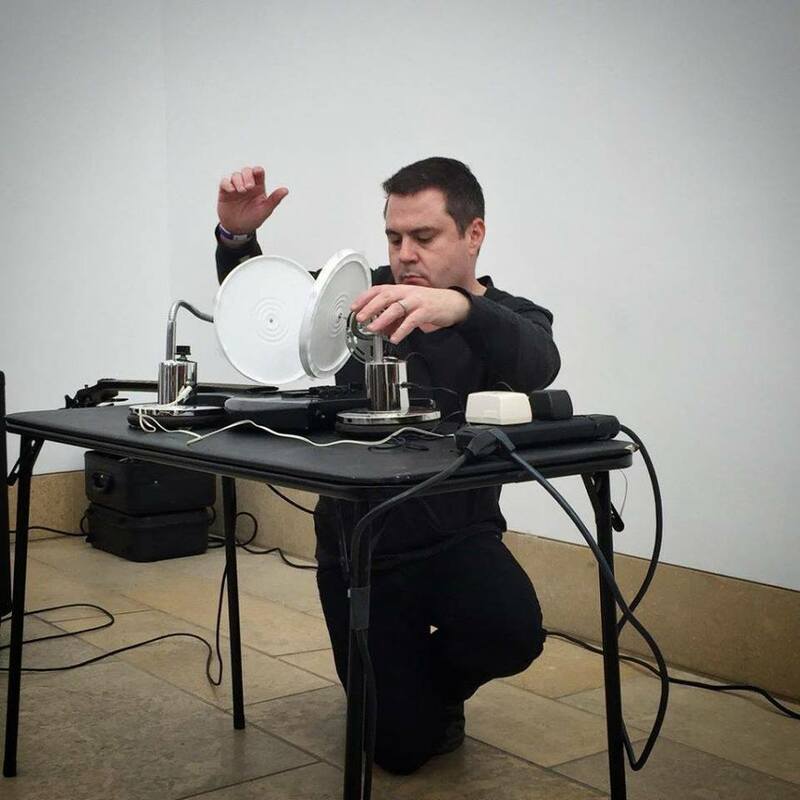 Alex Keller will lead a free workshop on the practical theory and aesthetic practice of field recording. Participants should bring a sound recording device and headphones; anything from a cassette recorder to a smartphone app will work. Use something you already have or can easily borrow. Alex Keller is an audio artist, sound designer, curator and teacher based in Austin, Texas. His engagement with performance, installation, and recording is an outgrowth of his interest in architecture, language, abstraction and music. One of his distinctive features as a creator is his ability to show the act of research as having an aesthetic value in and of itself. Using Mussorgsky’s Pictures at an Exhibition as a point of departure,SoundSpace’s roster of performing artists will buzz, distort, rove, and radiate throughout the Blanton, responding to the museum’s collection, building structure, and staff. – SECURITY CHORUS. Winner of the SoundSpace residency Sarah Mendelsohn has created a performance with members of the Blanton Museum’s security staff, exploring the dynamics of listening closely. For the duration of the SoundSpace event, Gallery Assistants participate as performers, roving throughout the museum’s spaces, narrating what they see and hear. What does working in museum security do to your voice, or to the ways you observe your environment? – CONCRETE JUNGLE. Austin-based Grammy Award winning musician, composer and producer Adrian Quesada will present a new work commissioned by the Blanton to respond to the museum’s Contemporary Latin American collection. Featuring Adrian Quesada, guitar, Greg Gonzalez, bass Peter Stopschinski, keyboard and Jeremy Bruch, drums. – AKIRASH will respond to the work of El-Anatsu and Cildo Meireles, focusing on the state of world economy and immigration. The economy plays a daily role in sustaining the livelihood of every home, community, state, country, and continent throughout the world. Each local economy is uniquely shaped by the culture and tradition of a place, creating diversity in how people make money, what they decide to sell, and how they market their products. Migration is our international dilemma. Nationalism and xenophobia are our symptoms; economic and political dislocation is our disease. Globalism and environmental disruption are our circumstances. – Saakred, a transdisciplinary artist with a focus in sound and live performance will be curating their original work in relation to their experience as both museum patron and employee. Using the concept of a museum as a microcosm for class, race and power inequities in the unchanging American landscape, Saakred discusses issues of security, visibility, access, facades of freedom, aristocracy and the role of art . Saakred will present four new works wedged between the all white work of minimalists Louis Nevelson and Mary Corse. All compositions are written, recorded, produced and performed by Saakred with a focus in MIDI production via Ableton 9 and Reason with additional live instrumentation for this one time performance. – Gene Coleman Philadelphia-based composer, director, and Guggenheim winner Gene Coleman presents his innovative music and video works featuring cellist Marina Peterson and Coleman on bass clarinet . The program will include material from his media opera “Dreamlives of Debris”, featuring the voices of Nicholas Isherwood, Sansuzu Tsuruzawa and members of the new music vocal ensemble The Crossing. – Jazz trumpeter and composer Jeff Lofton will perform improvisations using the Blanton’s collection as a graphic score. Jeff is a Grammy member and two time SXSW Austin Music Awards winner. Jeff has performed at One World Theater, Stateside at the Paramount, and the Long Center for the Performing Arts since his arrival on the Austin music scene in 2007. ALEX KELLER AND SEAN O’NEILL – In the Glickman Gallery, the artists will perform an unique visual score based on their interpretation of Kelly’s writing, interviews and works. 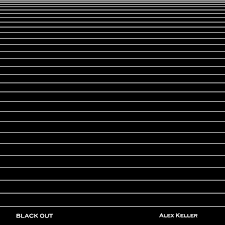 Alex Keller is an audio artist, sound designer, curator and teacher based in Austin, Texas. His engagement with performance, installation, and recording is an outgrowth of his interest in architecture, language, abstraction and music. Sean O’Neill is a multi-media artist, who explores both the visible light spectrum and the audible frequency range to determine how they influence our lived environments, and vice versa; he has a stated interest in how perception shapes the dynamics of spatiality. – Lisa Cameron (aka Venison Whirled) is from Austin, Tx. For this performance, she will use amplified percussion and strings to locate resonant frequencies in space to create oscillating overtones to respond to specific acoustic properties in the museum. – STRAIN TO SHINE. Adel Faizullina drew inspiration from Saint Catherine of Alexandria (c.287-c.305 in Alexandria, Egypt) to write this piece for voice, trombone and percussion. Catherine was both a princess and a noted scholar, who became a Christian around the age of 14. She converted hundreds of people to Christianity, when persecutions began under the Roman Emperor Maxentius. Catherine was taken as a prisoner and finally was killed. After death she became one of the angels of God. Closed and open sounds in the voice and trombone symbolize Catherine’s voice trying to be heard. In the middle section, her voice becomes stronger and more powerful, but death eventually silences her. A spiritual light illuminates the ending of the piece. – GAMELAN LIPI AWAN (Gamelan Rising Star). This orchestra comprises students and faculty from Texas State University, along with some members from the local community performing on traditional Balinese percussion instruments. They will play new works composed by Laura Brackney and Gordon Jones that reference the Atrium installation, “Stacked Waters” byTeresita Fernández, along with traditional Balinese works. – NEWSNOISE. Composer and curator of the SoundSpace series, Steve Parker will share a participatory ritual work for newspapers, voice, electronics, and poprocks. To exorcise the 2017 demons of radio propaganda, cable television news, and printed journalism. 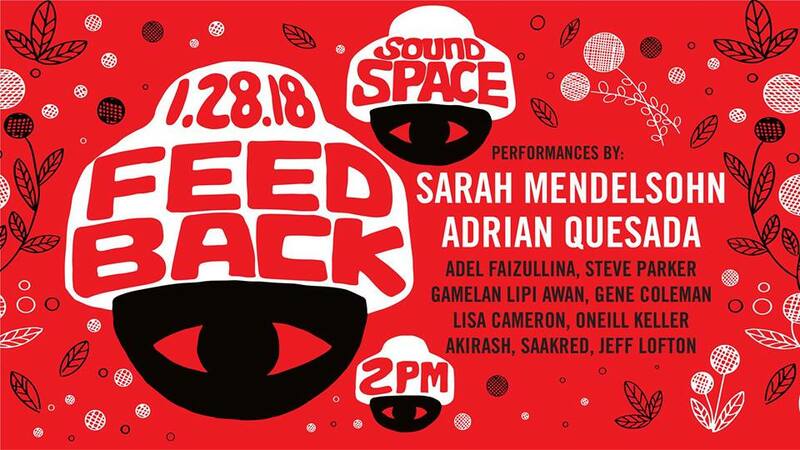 SoundSpace is generously underwritten by Michael Chesser. Paid parking is available in the Brazos Garage on Brazos Street and Martin Luther King Jr. Boulevard. Parking is $4; bring your ticket with you to the museum.